Can you name these forest fruits? Not all of these are edible for humans, but they do feed many wildlife. tinting this fungus the color of candy corn. Several of these caterpillars were munching on the carrots in my garden. 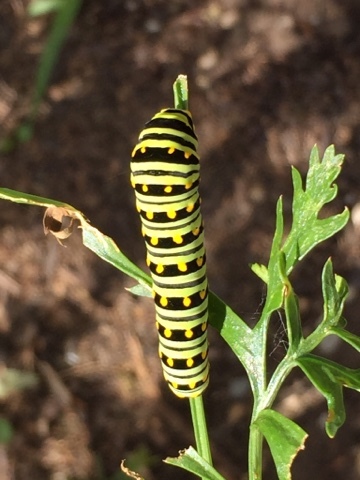 The field guide says they are tiger swallowtail caterpillars. Indiana is celebrating is 200th birthday this year. A torch is being carried through each of the 92 counties as part of the celebration. As luck would have it, we were there when the torch came through Madison. who carried it up to the courthouse. Madison really knows how to celebrate! We took a short trip to this quaint town on the Ohio river. including the historic Lanier Mansion. Tours are available of the mansion. This is a view from the 2nd level, looking out on the gardens and the river. To many duplex homes painted to appear like separate residences. Clifty Falls State Park is just outside the town and a great place to hike. This is a view from the inn, looking at the Ohio River. The town is also known for the jet boat races on the river. Lots of fun & loud engines! And who knew that the boats enter the water by crane! A beautiful sunset over the Ohio river. As the full moon rises over the bridge and our trip comes to an end. Just some scenes from Indiana! The nuts are dropping to the forest floor. Grandkids rush to collect them before the squirrels get them.